Posted on Tue, Feb 14, 2012 : 9:13 a.m.
Joe Moses as Severus Snape in "A Very Potter Musical." Joe Moses —one of the founding members of Team Starkid, the theater troupe born at the University of Michigan that hit viral gold with "A Very Potter Musical"—is featured in the New York Times Magazine, in an article (with photo gallery) published online Feb. 8. 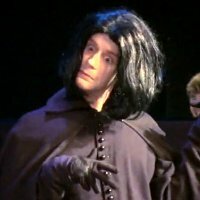 The short profile focuses on the contradiction of internet fame—namely, that Moses, who played Severus Snape in "Potter," is currently selling out performances of his one-man comedy show, "Joe Moses One-Man Showses," while also working as a bartender and being turned away from downtown clubs by bouncers.